Trish Knits.com – Be Warned… Major Whine. You are here: Home / blog / Be Warned… Major Whine. Nobody likes a whiner. But, the truth is, I don’t really care right now. It’s my blog, and I’ll whine if I want to. You’d whine too, if you’d only left your house once in the last 13 days. I’ve been snowbound, and on kid duty, to two kids who won’t admit it, but who desperately want to go back to school. They’ll get their chance tomorrow. I’m working from home, so I won’t actually get out til Thursday. But, since I’d only be going to the office on Thursday, I’m not really complaining. I’m frankly not looking forward to the nasty commute on slushy, snow-narrowed roads. Today my husband spent a total of 3 1/2 hours in the car. Our neighborhood itself has been cleared for a while, but we have no sidewalks here, and since the lawn still has more than two feet of snow on it, our mail carrier has been refusing to come. We get mail about once every three days. And I have a couple of packages that were due here a week ago from UPS that still haven’t found their way here. So, except for spending unreasonable amounts of time on sites like Facebook and Ravelry, I’ve been pretty much cut off from the world. You know what really irks me? I actually wished for this. A week or so of unplanned downtime was what I needed, I said. And it was good, at first. I cooked like crazy for the first week or so. I even made Indian eggplant. I thought I might get caught up on sleep, but it turns out I’m a crappy sleeper, no matter what. Dr. Phil really got on my nerves, and I got pretty tired of seeing all the stars of Valentine’s Day making the rounds on every single talk show. I will say that my daughter and I bonded over The Last Song by Nicholas Sparks, which was a good, easy read, though the subject matter touched a few raw nerves with me over the loss of my father. We’ve been a little lukewarm about the Winter Olympics, enjoying some of it, but I found myself wishing for more comprehensive coverage like we used to have when I was a kid. On the other hand, we were sorry to see the end of the Jay Leno Show, because even though he’ll be back on at 11:30 again, that timeslot is something that my daughter and I cannot do together. I did finally near the end of my Elf Hat, which should have been done at Christmas, but at times seemed not ever to be done, no matter how much I knitted and knitted and knitted. Today, I can say it is finally off the needles! The pom pom for the end of the hat is done as of tonight, too, but it still needs to be attached. 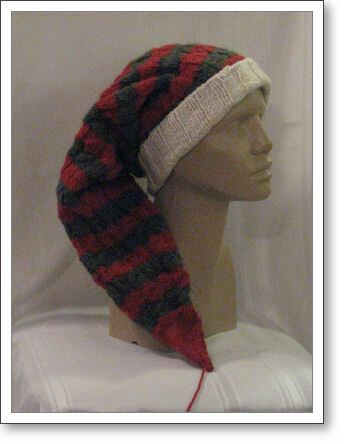 Plus, because the hat is striped, there is a mountain of ends on the inside to be woven in. I’m half toying with knotting them down and leaving them be, especially the ones wwwwaaaayyy up near the point, but I am sure the knitting police would surely strike me down, so in time, it will be finished. Now the question is what to do next. Yes, I have lots of unfinished things. But, truth be told, not one of them is exciting me at the moment. I need something new. I opened a mitten kit from Knit Picks earlier this afternoon, as Kelley Petkun is hosting a KAL on mittens, but alas, I didn’t have the energy to start anything today. I do have a sock and a scarf on the needles, but neither of them are making me happy at the moment. I’m feeling the urge to make a sweater. Yes, I have one on the needles, but I haven’t been happy with it for a while and I am thinking I need to frog it and start over. My buttonholes are a mess and I don’t like it that it’s sloppy. Still, I need to think of something by the time I leave the house on Thursday, because the very idea of a potentially very long commute with no knitting is scary. Back to that again. The long commute. You know, the last of the Big Snow fell here a week ago, and many of our roads are practically impassable because the snow piles are so big that it has been impossible to move enough snow off the roads far enough to make all lanes completely usable. So our already crowded roads are severely gridlocked and it is very unpleasant. So yes, I wanted some extra time with the kids, and some extra sleep, and some time for knitting, and napping. But now, it’s been so long since I’ve been to work that I’ve frankly forgotten where I left off, and I dread the size of my e-mail inbox tomorrow. I was behind on stuff before, but now it’s much worse, I’m sure. So, I’ll be digging out… in more ways than one. Well I hope your commute and your first day back to work will be trouble free. Congrats on finishing the hat, it is very cute. And what ever happened to the “through, rain or sleet or snow the mail will be delivered. They should deliver your mail if they are able to be out and about on their routes. Can’t wait to see what you decide to knit on next. You should join us-Hubs and I are jetting away to Mazatlan for ten days. Our son and family have been staying with us until they find an apartment (long sad story) and it’s getting crazier and crazier, so I got online and booked us an impromptu vacation.